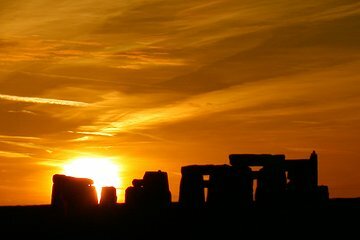 Bekijk Stonehenge in de schemeringuren tijdens deze speciale avondtoerentocht vanuit Londen. Met een lokale deskundige gids krijgt u buiten de openingstijden toegang tot de UNESCO-werelderfgoedlocatie, inclusief een rondleiding van 1 uur door de geschiedenis. Eerder op de dag kunt u een stop maken in het middeleeuwse dorp Avebury en een wandeling maken op de heuvel naar West Kennet Long Barrow, een 5000 jaar oud neolithisch graf. Vervoer van en naar het centrum van Londen is inbegrepen. Verken Stonehenge's Inner Circle na uren, wanneer de UNESCO-site voor het publiek gesloten is. We took this trip on Friday May 11 with Nicholas?, and it was honestly the highlight of my 2 week to the UK. We were picked up promptly in a very nice coach with a toilet, and Nicholas provided us with a lot of information about the prehistory of England as we drove to the Neolithic sites. He was really well-informed and easy to talk to, and catered to the wide variety of guests on the tour. Avebury was a gorgeous, small, medieval town that we had about an hour and a half in. Nicholas gave us a quick tour of the town and then let us wander around by ourselves for a good amount of time. West Kennet Long Barrow, the Neolithic burial tomb, was fascinating to go in, even if our time there was short. The best part of this is obviously the private, one hour viewing of Stonehenge you get to experience. Our group was the only group that had access to the inner circle that night, and it was an experience I'll never forget. Plenty of time at each location, and Nicholas was so pleasant and informative to talk to about the sites and history. The security guards working that night were also so friendly and fun and gave us even more info about current research being conducted at the site. Take this tour you will not regret it!! This was an incredible trip/opportunity. To have access to Stonhenge after closing and be able to walk among the stones was so unique and so wonderful. Manon, our tour guide, was knowledgeable, friendly and accommodating. Cliff, our driver was terrific as well. If you have the opportunity to take this tour, don't pass it up. I highly recommend it. This was a fantastic opportunity to go into the circle of stones after the park was closed to the public. Our group were the only ones there and our guide was wonderful at giving us detailed history of the area. It was up close and personal, something you don't get with other tours. A suggestion for improvement would be to have the same drop off points as pick up points in the morning. It helps those not familiar with the area to plan better. Our tour guide was very helpful with advice to anyone who needed it to get back to their hotels, but having the same drop off and pick up points would have been better. Thank you for an AMAZING experience!